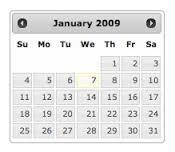 In this article we will see how to render jQuery DatePicker in inline mode. Generally datepicker opens up on click of button or on clicking inside textbox. The inline display the datepicker embedded in the page instead of in an overlay. We need to call .datepicker() on a div instead of an input to achieve inline datepicker. We will see how we can render Inline DatePicker in MVC3 Razor application. The above is our ViewModel. The ViewModel contains a property which is of type DateTime. As you can see we have define DataAnnotation property UIHint which indicates to call EditorTemplate with name DOB to render control for this property. In EditorTemplate we are rendering a div element. Include the above jquery files in your layout referred by View. Using the Div instead of textbox, we could render datepicker in inline mode i.e. embedded on page.